Ever had a day where you just needed a non-judgemental listener - one who gives you undivided attention and can keep a secret? As dog owners we immediately turn to our dogs. 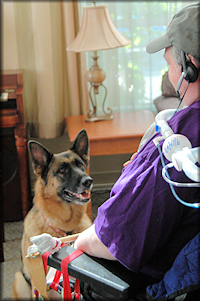 Now imagine you are in a hospital or residential facility without your dog. Therapy dogs visit these facilities and perform those services - they listen, they get petted, they get hugged, they help with physical therapy programs by retrieving balls tossed as the patient relearns the use of an arm ... the list goes on and on. It takes a very sound dog who likes people and has good solid nerves to handle the programs. The smells of a medical facility are hard on a dog's sensitive nose. There are noises, people who look, act and move in a manner most dogs are not used to. 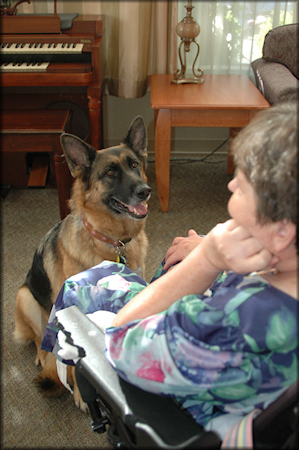 But the dogs handle it and many enjoy their visits as much as the patients do. One of our members described her dog's recent visit. There was a young girl who found reading such a struggle for her that she did not want to participate. She struggled through her few pages but the dog did not care she stumbled on the words. Instead she placed her head on the girl's lap and listened for her allotted time. After several hours and a number of other kids, the first little girl came back and asked if she could read another story as she wanted the dog to hear her do it better. The dog wagged her tail and listened again. Instead of hating reading the little girl now wants to read to the dog weekly to show off her progress. A good listener makes the day better. Therapy dogs have to meet some stringent requirements. Certification is available through THERAPY DOGS INTERNATIONAL or the DELTA SOCIETY and programs are generally run through any of a number of organizations. They all have their own specific requirements based on the programs and facilities served. The GSDC of Oregon will host another TDI certification test in 2013. 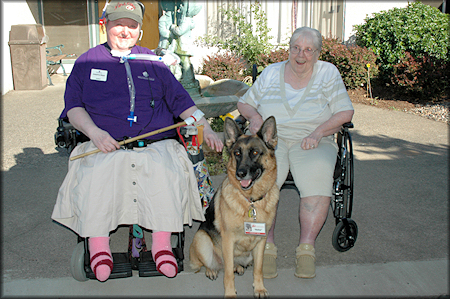 Several of our members have active Therapy Dogs and they will be happy to answer your questions.